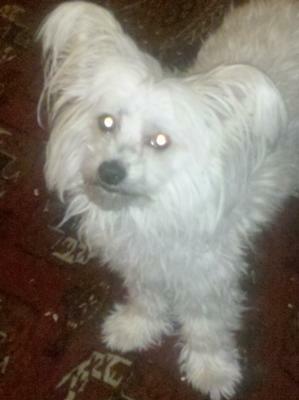 I got my Maltese Papillon rescue from the local shelter last week. He was very badly matted and they cut some out but we've got a long way to go. The vet thinks he's 2 to 2 1/2 years old. I have two cats and he's great with them. I'm very happy to have found my new "boy"! Congratulations on new adoption. We have a rescue Maltipom. I am firm believer that she rescued us. Enjoy new addition! I am so happy to find this web site, my Maltese Papillon rescue dog turned 2 years as of May 31.Pippi is very energetic, friendly and smart. My only concern is,he acts hyper when meeting others. I have had no success in training him to sit and allow others to pet him. Otherwise he is fantastic. He weighs 13.5 lbs, he is white with black markings, his ears are the half up, his coat is long and very soft and never mats but he sheds a lot and nothing stops it. My Papitese plays catch and throws the ball to you,he was a breeze to house break,he is very intune to how I feel.I am a 68 year old cancer survivor and when we are walking if he gets too far ahead of me he stops and waits till I catch up. He loves baby carrots which is his favorite treat. Pippi meets no strangers and is the darling of the senior building I live in. He likes adults, children, large dogs and small dogs. I have lots of photos of him but dont know how to put them on computer yet I must have my son show me how. 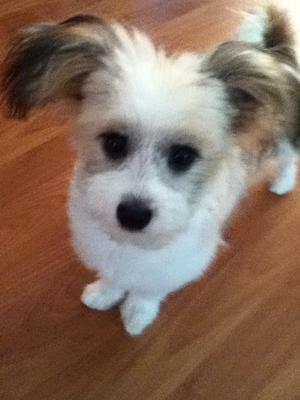 I bought my Maltese Papillon mix Pippi from a rescue home and his tail had been broken. Just wanted to say that I love your story and so glad to hear about such a good rescue. We rescued our Maltipom last year and she is our joy. I understand the feeling of bursting to tell someone. Enjoy each other. 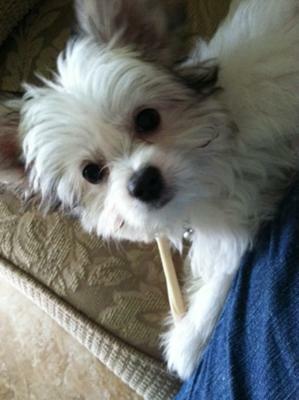 Bentley is a sweet a little Maltese Papillon mix boy that is very forgiving and kind hearted. He greets everyone that comes to our house by dancing. He will dance for hours. When Bentley bites he makes it between his teeth so it's doesn't hurt. Bentley loves to be petted. Once you meet him you'll love him. Bentley always is playing with our other dog, Harley. Bentley has this one cat toy that I gave him. He tore it so he needs to wait for it to be sown. One night he woke me up by barking and looked at the cabinet it was in and I knew that was what he wanted. He'll tell you if he wants something since he's very playful. Bentley is very protective of his love ones. He has met the snow and it was not fun. He hates to get his paws wet. Bentley will run from our cat Callie. He loves to play fetch and play tug-o-war. Bentley may seem mean at first when he barks and growls at you but this dog will love you to pieces when he gets to know you. My Papillon mix loves everyone and is always up to play. That's Bentley for you. "Noel" is my precious black and white Papitese! My sweetheart was smart to get her after I was being dumpy about getting a new dog. She has a birthday tomorrow and weighs 5.1 pounds. What a great Christmas we had! Now it is Christmas everyday. Best looking pup I know. She is a real tiger and knows how to get down on a squeaky toy! Noel is very loving and puppy kisses are highly recommended, but a Papitese tongue up your nose is an acquired taste! We had steps for her and a ramp that helps her into bed, but many of them are no longer necessary. We plan to bake some dog treats for her party. She prefers people food and always eats her vegetables. I love to photograph her and I am sure she will be famous here! Thanks "Sweet Love" for bringing "Noel" home! My Papitese, Oliver, is two years old and he is a very intelligent and friendly dog. Oliver is an expert snuggler. Oliver's favorite activities are playing fetch and welcoming new people into our house. Oliver is very protective of our house and alerts us every time someone walks by. Oliver has changed my finance and my life in the best way possible. walking into the door to an overexcited best friend warms our hearts every day. OMG! What an adorable dog! 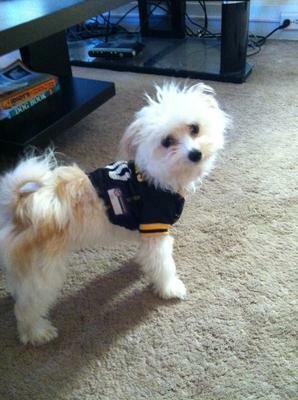 Go Steelers! I was looking for a rescue dog and not finding what I wanted, so I began to look in some pet stores. From the minute I saw his picture online, I was hooked. Went to the store THAT SAME NIGHT and brought my male Papitese home with me. He is so cute, loving, intelligent. 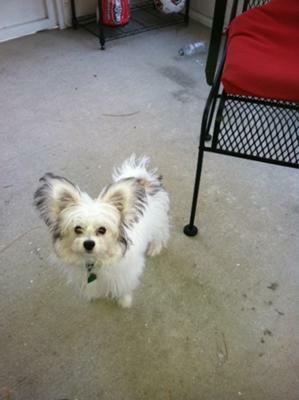 Couldn't be happier with my Maltese Papillon mix Mickey in my life. My cat can't say the same just yet, but they are learning to get along. Thank you so much for sharing his picture he’s adorable! 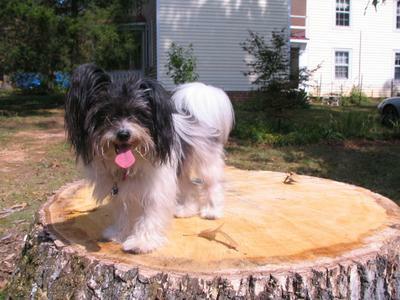 Molly came to me as a Maltese Papillon rescue. The Vet said she was found behind a dumpster, matted, brused and scared of men. So sad! 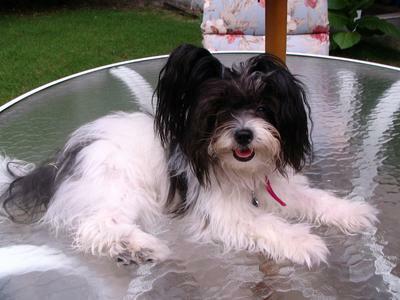 I've had Maltese in the past, my mother dog lived to be 17. After she died, I just couldn't think about another dog. That is until a friend told me about a dog that needed a home. She said she'd bring her to me on her way to work and if I wasn't interested, she'd pick her up on her way home. As soon as I saw her, I knew she had found a home. I'm retired and home all day and she is the best thing that could have happened. She was very easy to train, she does circles when she has to go outside. She loves everyone who walks in the front door and barks every time she hears a doorbell even if its on TV. She gives lots of kisses and has even licked my cat. When I leave the house and my Maltese Papillon is not with me she sits in my bedroom window sill until I get home, even if my husband is home. She waits for me! She may be a rescue but I am the lucky one!! Thanks for posting about Molly. I sure would love to see a picture of her.